They say change is inevitable, which is certainly true when you have kids. Sometimes, though, busy moms could do with a little less change — or at least change that's not so messy. That's where the QuickZip® sheet comes in. QuickZip from Clouds and Stars is an innovative sheet invented by moms for moms. It takes a chore we all hate — changing crib or bunk-bed sheets — and makes it, if not fun, at least painless. First, you place a mattress in the zipper base sheet. Then, you place the mattress on the bed. Next, you zip the zipper sheet to the base and tuck in the pull. 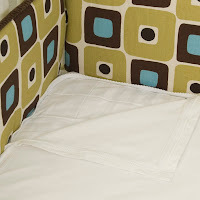 When the bed needs changing, you simply zip off the zipper sheet and zip another into place. That's all there is to it. No lifting mattress corners or moving bed frames or calling for help. Best of all, QuickZip sheets are as beautiful and comfortable as they are functional. They handpick fabrics that easily coordinate with the décor of any nursery or child's room and that are soft and comfy against your child's cheek. And, of course, they're perfectly safe. There are no corners to pop off, and the zipper is fully enclosed in protective fabric. I generously received the Organic Crib Starter Set from Clouds and Stars. 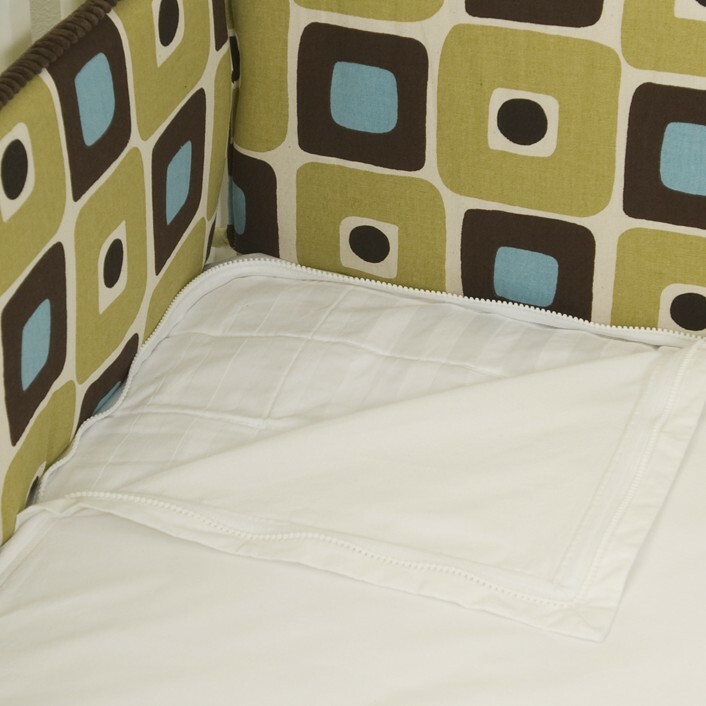 The patented two-piece QuickZip® sheet set is designed to be simple, safe and stylish. The top zips off the base for easy changing. No more mattress wrestling or constant tying and untying of bumper ribbons. Unlike loose-fitting sheets that can cause an entanglement danger to your baby, QuickZip® fits snugly around your mattress. And since they preshrink all our fabrics, their sheets fit wash after wash. The starter set includes one zipper base and one zipper top. I have seen the Quick Zip sheets talked about on blogs for months now and every time I read about them, I was so JEALOUS! :) They looked amazingly easy to use and put on a mattress and every time I had to change my son's crib sheets, I recalled these amazing Quick Zip sheets and wished I had them! Thanks to Clouds and Stars, I now own my own Organic Quick Zip sheet set and they are as amazing as I thought they would be!!! Secondly, these sheets WERE super easy to use! The first day I got them, I immediately put them on my son's bed because I didn't want to live another day changing sheets the hard way. The base sheet was easy to slip on (but I am glad I only have to take out the crib mattress once to do that!) and then the top crib sheet zipped on as easy as zipping up a coat! My mattress protector and mattress pads fit underneath the sheet with no problems and the sheets were very snug! My son decided to test these sheets out the first day as he had an "accident" (more like an explosion) while he slept. I was SO GLAD I had taken the time to put on these Quick Zip sheets because I could now just unzip it, throw it in the laundry and zip it back on again! They didn't shrink and they looked just as good as new...for the second time! I am so excited to have these in my crib for the new baby - it will make changing the sheets in the middle of the night so much easier than with my son (when I changed sheets the hard way)!!! Thank you again Clouds and Stars for making such an innovative and easy to use product! Buy It: You can purchase the Quick Zip Organic Crib Starter Set (includes one zipper base and one zipper top) for $59.99 from the Clouds and Stars website. Win It: Clouds and Stars is generously offering (1) Organic Crib Starter Set (includes one zipper base and one zipper top) to a lucky winner! wow! bunk beds are the worst!! I have been voting for you on Top Mommy blogs, but I am not sure the link is working. I have been looking into these. Did you find it easy to change with a bumper? Yes, these sheets are easy to change with pretty much any obstacle :). It is seriously as easy as unzipping your coat. It is a little harder to get the bottom sheet on the mattress when first starting out but after that all you worry about is unzipping and washing the top sheet! SUPER EASY and still one of my favorite baby products out there!